Windows 10 contains many new features as well as changes from usual practices when comparing with previous versions of Windows operating system such as Windows 8 and Windows 8.1 The differences are even more glaring when comparing with Windows 7, Windows Vista and Windows XP. 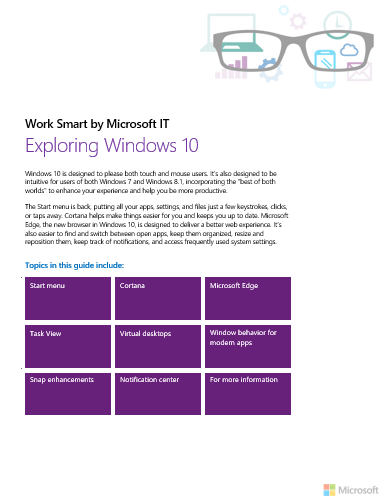 Microsoft released a free Windows 10 eBook, titled Exploring Windows 10, that introduces the new and enhanced features of Windows 10, and provides simple guide on how to perform regular tasks. Download Exploring Windows 10 eBook from Microsoft Download Center.